Sony’s Project N headphones project sound to your ears | What Hi-Fi? The headphones are the first product from Sony’s new Future Lab R&D department and are worn around your neck as opposed to on your ears. The idea of the headphones is to create a “music bubble” using speakers placed in the neckband that direct sound to your ears. 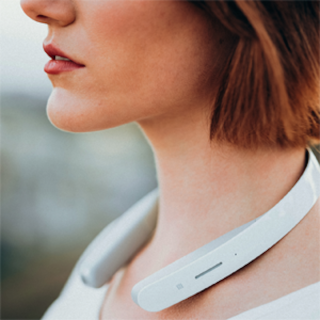 Sony says you won't become a walking speaker; supposedly only you can really hear what’s being played, though people around you will be faintly aware of music emanating from your neck. And the reason for leaving your ears free? It’s so you can still hear noises going on around you, making them safer for cyclists and pedestrians, for example. MORE: No headphone port on iPhone 7 "confirmed"
If you do find yourself wanting earbuds then Project N comes with a pair that have holes in them so you're still able to hear external noise. You can use your voice to control the neckband too and there’s even a built-in camera which responds to the name “Arc”. Sony has said Project N - on show at South by Southwest (SXSW) in Austin, Texas - is purely a prototype at the moment, with no word on whether it will make it into full production.